If you are a seller on Etsy, this list comes in really handy if you are using state destinations as a pricing variation. This is great for offering a stand alone shipping upgrade! I use the pricing variation for Express upgrades when the customer has already checked out then sends me a message saying they need it quick. You can see my actual upgrade listings for Express Shipping Upgrade. NOTE: You will be charged Etsy transaction fees when you list an upgrade as a listing with pricing variations! The cheaper way to do shipping upgrades is to incorporate the shipping upgrade into the shipping profile. But this method works well if you need to have a stand alone shipping upgrade. 1) Create a new listing. 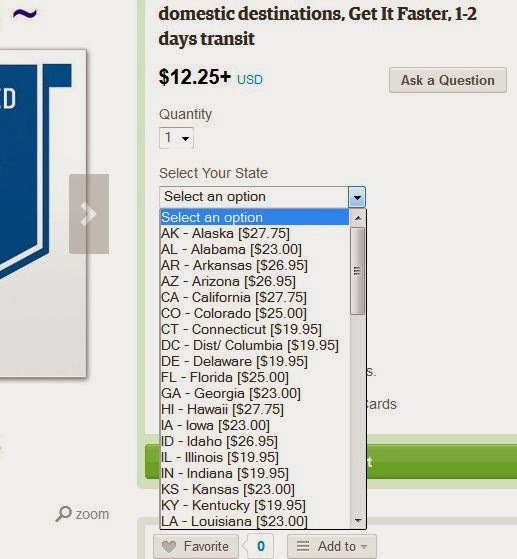 2) Under "variations" select "Add a new property"; Let's call this "Select Your State". Click Add. Then a box comes up where you can enter the options for that property. After you enter a property you'll see the "add pricing" blue link pop up; click it to add pricing to these options. Here are the state abbreviations with the state names. Copy and paste them in clumps (red then black, then red then black); you will copy and paste 4 times to get them all listed. Etsy has a limit on the number of characters that can be copied so I divided them up for you. 3) Now that you have your list. Click the "Add Pricing" link and boxes appear next to each option where you can enter the cost of that property option! 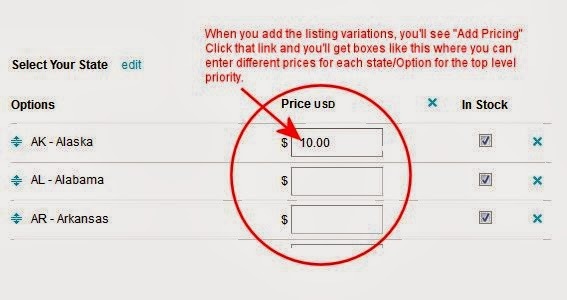 When your listing is published, this is how it will look in the drop down selection box for pricing variations. Note that the lowest variation price is shown in bold as the listing price with the "+" sign next to it.